Grammy's Attic: Is It Fall Yet? A darling card with that happy and fun looking image! As far as fall......mercy me, it can't get here quick enough. Like you, we've had WAY too many over 100 degree temps and I'm tired of it too. Even if you can go outside, you have to deal with the Ozone layer bad days and now we have something called Mosquito Alert days too! This is gorgeous Connie, love the image. Sorry you are suffering with the heat. A good plan to make winter card, just hope it helps cool you down. Oh I love this card, it is just adorable with that deer with those big eyes! Love the fall papers and that orange ribbon! Thanks for joining the Challenge at Carlin's Kaartenparadijs and good luck! Super design. Great image, beautifully coloured. Thank you for joining in the Crafty Calendar Challenge this month. Good luck! Thanks for sharing your cute card with us at Crafty Friends Challenge Blog, it fits perfectly with our Ribbon and/or Lace challenge theme… good luck in the draw and please join us next time. Cute card with great paper. 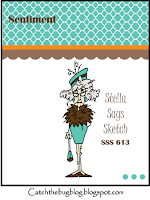 Thanks for joining us at CHNC Patterned Paper Challenge this month. Wonderful card, NC and a great take on the sketch. If that works for bringing in cooler temperature let me know. We aren't over 100 but the humidity here is enough to keep you running for the air conditioning. I am ready for fall too. Sorry we can not let these card participate in our Anything Goes + Anything Goes challenge at Carlin's Kaartenparadijs, because in july you have already submitted 2 times and 1 in august (max. 3 times/challenge) that is the limit. But your card is very beautiful. I hope to see you back next month. 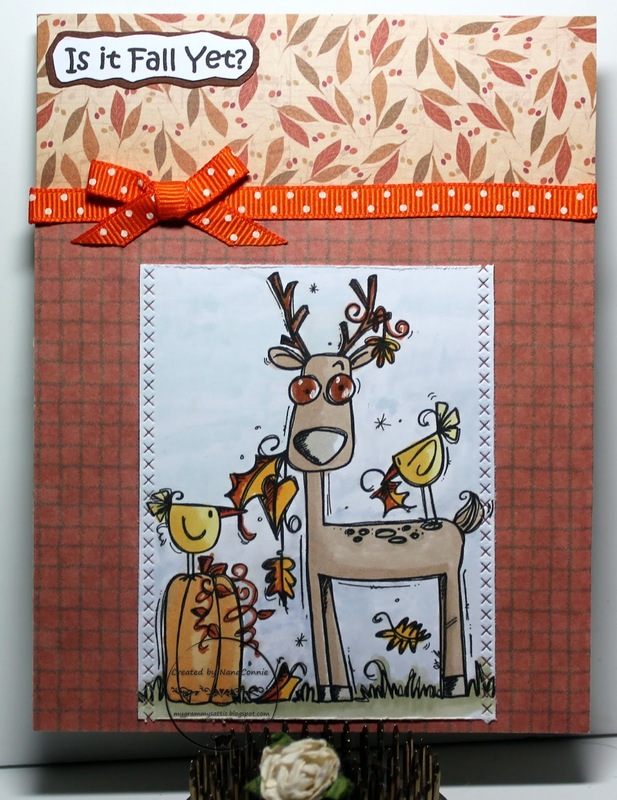 A wOnderful Autumnal card, great image and design Connie. It's raining here, helping to green up the grass, BUT I miss our heat boo hoo. Thank you so much for entering the Monday Greetings challenge at The Outlawz Challenges this week. Looking forward to see you again next challenge. What a cute card! I love how the pattern paper compliments the stamps! Thank you for playing the Lawn Fawnatics Challenge!